Daniel chapter 2 is a riveting story, even more so because it actually happened. The king of Babylon, Nebuchadnezzar, was having vivid dreams that were troubling him because he did not know what they meant. The king summoned all the wise men, the enchanters, and the astrologers in Babylon so that they could interpret the dream to him. But Nebuchadnezzar was so desperate to know what his dreams meant that he did not want to leave anything to chance, so he asked them the impossible: to first tell Nebuchadnezzar the dream he had and then interpret it. Obviously they could not do this, saying “no one can reveal it to the king except the gods, and they do not live among humans,” (Dan. 2:11) so Nebuchadnezzar ordered all the wise men be put to death. Now Daniel was unaware of this ordeal until the guards that were going to execute him arrived to arrest him. 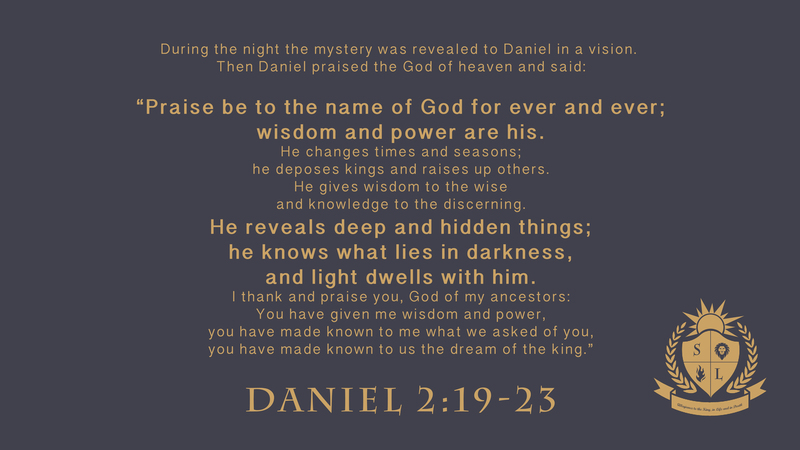 Daniel asked the king for more time and asked his friends to pray for God to do something that only He could do, to give Daniel the dream and the interpretation. In His goodness God did just that and Daniel told Nebuchadnezzar his dream and the interpretation which resulted in glory to Daniel’s God and the saving of their lives. Although God is always working, the vast majority of His work we will never see. But sometimes God thrusts us into the center of what He is doing and we must be ready for those times, not relying on our own strength, wisdom, and insight but wholly ready to cast ourselves upon the mercy and the grace that God provides. Daniel 2:18 says “He urged them to plead for mercy from the God of heaven concerning this mystery, so that he and his friends might not be executed.” What did Daniel turn to in impossible circumstances and what do you naturally turn to in times of crisis? Sometimes God puts us in circumstances where we need to be a witness for Him when we least expect it. How does Luke 12:11-12 encourage you? Read Colossians 4:5-6. What does this passage say to do in order to be always ready?